American furniture designer and woodworker, Sam Maloof was the first craftsman to receive a MacArthur fellowship. Maloof’s work is in the collections of several major American museums. He was described by the NY Times as “a central figure in the postwar American crafts movement”. Sam Maloof was born in 1916 in Chino, California, to immigrants from Douma, a lovely Mediterranean village in the mountains of what was then Syria and is now Lebanon. After high school, he worked as a graphic designer and printer. Between 1941 and 1945 he served in the army, where he devoted himself to technical drawings, and later obtained a place in an art department of the college in California. After his handcrafted furniture, including stereo cabinets and cork coffee tables, Maloof discovered that his unique designs were in high demand. Spiral staircase, Sam and Alfreda Maloof Foundation for Arts and Crafts. 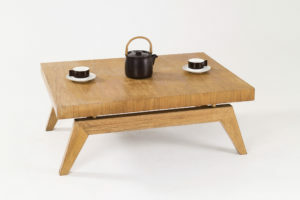 Sam Maloof designed elegant Shaker-influenced wooden furniture that gained him a prominent place in the American post-World War II crafts movement. 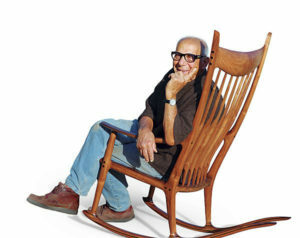 Among Maloof’s simple handcrafted walnut pieces were cradles, bar stools, hutches, and the one for which he became best known: a chair on distinctively curved rockers. 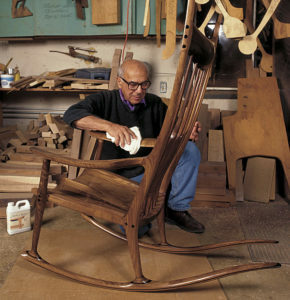 Maloof’s most famous form is without question his rocking chair, the first of which he created in 1958. He reinvented this American classic by identifying the inherent problem of the form and reworking it; most standard rockers have a grain of sawn wood that weakens the ray of the chair while Maloof’s rockers feature a sturdy construction composed of seven layers of laminated wood. 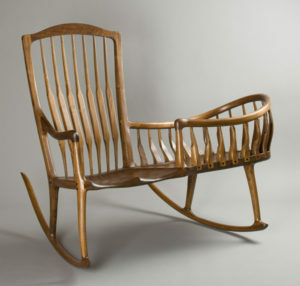 Sam Maloof’s rocking chair was such a popular design that it was owned by Presidents Jimmy Carter and Ronald Reagan. The chair exhibits clean lines and is a prime example of the modern aesthetic. Ray Charles ran his hand over the Maloof chair, commenting that he could “feel its soul.” A walnut and ebony rocking chair sold for $80,500 at Bonhams in 2012, setting a new record for the chair at auction. Not only are his rocking chairs structurally sound, but with graceful, elongated runners, simplicity of form and a refined finish, they have a distinct sculptural quality and are a true melding of art and craft. Maloof’s work has been given to US presidents, collected by celebrities, and admired by art connoisseurs far and wide. It also has been the subject of major exhibitions across the country, but this is the first to examine closely Maloof’s contribution to the development of art in Southern California. The House That Sam Built: Sam Maloof and Art in the Pomona Valley, 1945–1985. Although he built his home in Alta Loma, a more rural and affordable community east of Claremont, Maloof was a central part of the lively Pomona Valley art community. With the home that Maloof and his wife Alfreda created for themselves in the mid-1950s as its central metaphor, “The House That Sam Built” and accompanying catalog of the same title sheds new light on the rich network of influences and exchanges that developed among artists and artisans living near the college town of Claremont in the Pomona Valley. Covering a dynamic period in American art, the exhibition spans the development of Maloof’s work from his earliest explorations of handcrafted furniture in the 1950s to 1985, the year he received the Genius Grant from the John D. and Catherine T. MacArthur Foundation.“The House That Sam Built” includes three examples of Maloof’s classic form, the rocking chair. Two were made for Alfreda and one, a child-sized rocker, was made for his grandson Aaron. It also features one of Maloof’s largest and most elegant forms, a free-standing cradle. How Can We Identify Maloof’s Style Of Design? 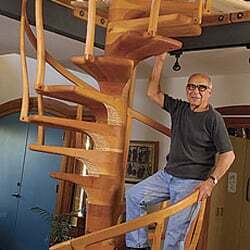 Throughout his sixty years as a woodworker, Sam Maloof remained remarkably consistent. Never formally trained, Maloof’s designs emerged from an organic process of instinct and craftsmanship. He hand-sketched and hand-worked each of his designs, adjusting elements by eye, not measurements, to make each piece unique. Further, his works feature rich, tactile surfaces, achieved by applying a mixture of linseed oil, tung oil, and beeswax to the wood, which was then polished with steel wool to create a high sheen, his signature finish. This labor-intensive method imbued his furniture with warmth and character. 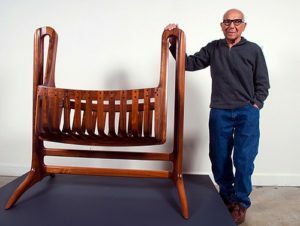 Despite a long wait-list for his pieces, Maloof’s output remained small averaging only eighty pieces a year and only rushing orders for baby cradles. 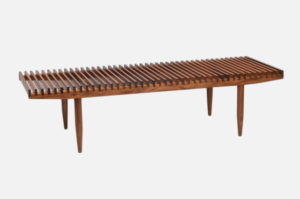 Rare Maloof cocktail table features floating top with splayed legs (1954).